The SP 6430DN is an A3 black and white printer with a compact footprint, barely larger than an A4 system. This reliable printer is a cost-effective investment while offering low cost of ownership due to its low power consumption during operation and standby. Standard duplex printing and an output speed of 38 pages/minute make sure you do not have to wait long for your printouts. The SP 6430DN delivers the first page within 6.5 seconds after a warm-up of 16.6 seconds. The maximum print speed is 38 pages per minute and the print resolution is 1200 by 1200 dpi. As a recommended monthly peak load Ricoh calls 150,000 pages. Ricoh expands its range of laser printers with the A3 black-and-white printer SP 6430DN. In particular, the manufacturer emphasizes its compact design: At 45.9 x 39.2 x 34.8 centimetres, it is barely larger than an ordinary A4 printer. The dimensions are for the standard paper capacity of 500 sheets. This can be expanded over four more cartridges - which makes the printer then naturally higher. The second feature of the launch is Ricoh's lowest energy consumption in its class, with a TEC of 1.81kh. In sleep mode, the power consumption is below one watt, an ECO Night sensor and a weekly timer could further reduce energy consumption. 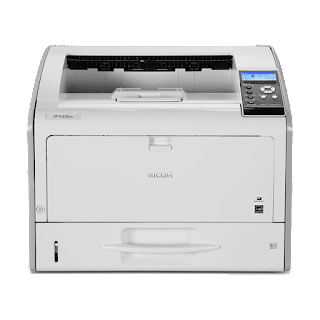 The SP 6430DN delivers up to 38 pages per minute, handles duplex printing and can always be connected to the network via Gigabit Ethernet port, optionally via WLAN (802.11a / b / g / n). It can access computers with all major Windows versions and Mac OS 10.6. For printing from mobile devices, Ricoh's Smart Device Print & Scan app is available. PCL5e, PCL6, Adobe PostScript 3 and PDF are supported as standard printer languages, as well as XPS and IPDS. Also optional is a 250 GB hard drive with encryption and overwriting. The toner capacity is 10,000 pages Ricoh, with the starter kit to be able to print 6000 copies. The paper feed capacity is 500 sheets but can be extended to 2100 sheets, the paper output can hold a maximum of 500 sheets. The EPP for the Ricoh SP 6430DN is 2100 Euro. 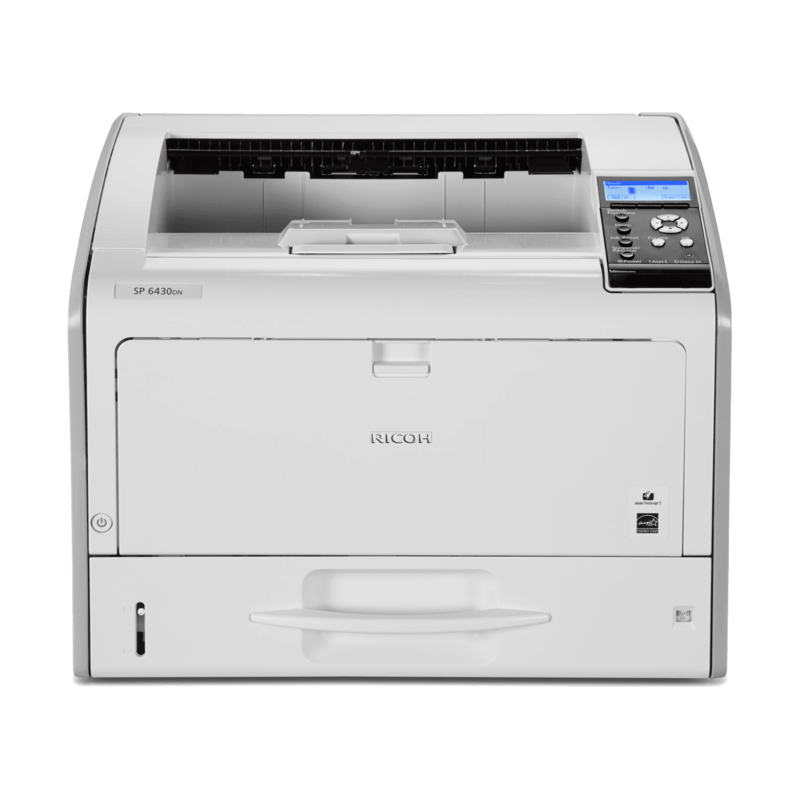 Thus, the new product is slightly more expensive than, for example, the Kyocera FS-6970DN, which is available online from 1770 euros. It delivers nearly as much as the SP 6430DN at 35 pages per minute, offers the same print resolution and is almost as compact as the Ricoh competitor, with an inch more depth and 3 millimetres more width. However, the maximum paper capacity of 1350 sheets is much lower and the paper tray with 250 sheets holds only half. You also have to do without the possibility to access via WLAN. However, this should be the smallest problem, these models are anyway intended as workhorses in environments in which other, smaller (colour) printers are likely to be found. Another plus point in Ricoh's energy consumption is that the FS-6970 requires six times more power in sleep mode at 6.3 watts. Outstanding media flexibility means paper up to A3 size and 220g / m² grammage can be used. The standard paper capacity is 600 sheets, with the option to expand up to 2,100 sheets from 5 magazines, making the SP 6430DN ideal for long runs and intensive use. You also do not have to wait long for individual printouts, since the first print is printed in just 6.5 seconds. This driver works with both the Ricoh SP 6430DN series download.